What’s the matter with middle-aged working class white Americans? 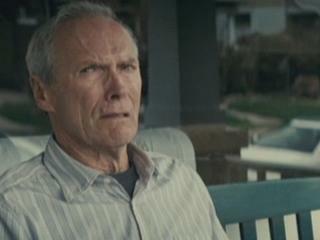 Clint Eastwood’s Gran Torino hasn’t yet made it into Keith and Johann’s film selections, but no doubt will. It’s a witty and moving, if formulaic, exploration of the psyche of the American white working class, represented by Eastwood’s character Walt Kowalski, a retired car worker in industrial Michigan. The article (full text here) is a fine piece of old-fashioned statistical reportage. Perhaps you need a Nobel Prize in Economics, like Angus Deaton (co-author with Anne Case), to get away with an important paper free of equations. 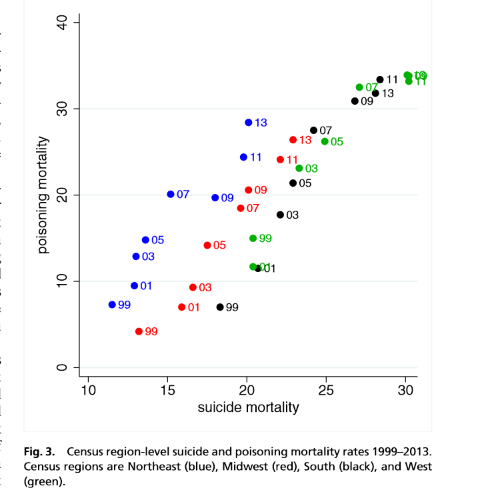 They left black men off the chart, I suppose because the line would be above the white men, as mortality is still higher than for whites, obscuring the main point. But it declines, parallel to the American Hispanics and everybody else. the geographical distribution is all over the place – it’s not concentrated in the South, and all mega-regions show a wide dispersion between census areas. Paul Krugman describes the finding as a portrait of “a society gripped by despair”. The nearest historical analogy is the fall in life expectancy of Russian men after the collapse of the Soviet Union, which combined a dramatic loss of economic security and the uprooting of an entire social structure based on a failed ideology. But what peculiar causes drove a change in the USA that wasn’t general, or general for men, but limited to white working-class men? Inequality increased in other OECD countries, where health continued to improve. Case and Deaton and .. suggest the cause might be an increase in economic insecurity. Didn’t this affect working class blacks and Hispanics just as much? And women? It is tempting to point to the cultural shocks some of which Eastwood explored in Gran Torino : feminism, immigration, the narrowing of the opportunity gap for blacks and Latinos, and gay rights, in sum a striking loss of relative status compared to other groups of Americans and foreigners. In addition, the collective spokesmen for the white working class – the enfeebled unions, the progressive wing of a Democratic party becoming a rainbow coalition of minorities and women – ceased to be effective. These factors were present for working-class white British and French men too of course: look at New Labour. Add in the economic insecurity and secular wage freeze, present in other OECD countries but to a lesser extent. It’s possible that the decline in unionized mining and manufacturing in the USA hit white workers more than minorities, because unions often accepted or reinforced discrimination by employers. The final newt in the witches’ cauldron was the extreme weakness of the American safety net and patchy health care. If you throw all these together, you get a set of factors specific to white American working-class men. This can be called the “perfect storm” theory. It takes the Job-like assault on many fronts to produce the flight to drugs, alcohol and suicide. A German man on the assembly line at Volkswagen also had to cope with uppity women, gays and immigrants; but he kept his job and pension. A British miner lost his job, but the NHS was still there for his health care. It’s an optimistic theory. For if it takes the full conjunction of factors to produce rising death rates, tackling any one will have a large restorative effect. It would be much easier to repair the safety net than to restore the high-wage, unionized manufacturing jobs Erik Loomis pines for. Question for Daniel Kahneman: are we biased to look for single causes rather than multiple ones? The general confusion over oncogenes and environmental cancer triggers (SFIK you need both) suggests that this may be so. If I did this for a living, I would dig into the geographical variation. There are sub-regions in all parts of the USA that look like France, others that look like Russia. The same general causes were operative in both, but the perfect storm theory could in principle generate the dispersion. For example, the Bay Area of California is exceptionally full of patriarchy-destroying uppity women, Latinos and gays, and I suppose very unequal in income from the winner-take-all capitalism of Silicon Valley, but a working man in Oakland can get a job and the health care safety net in California is better than elsewhere. What’s the death rate? 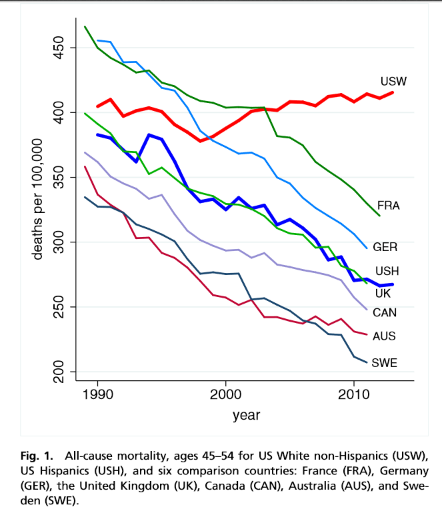 Kevin Drum points out that Case & Deaton also provide a chart showing sharply rising death rates from “poisonings, suicide, and liver” among whites of both genders and all age groups. C&D: “the midlife group is different only in that the sum of these deaths is large enough that the common growth rate changes the direction of all-cause mortality.” This counts against my synergetic hypothesis; the effects may simply be additive. Where is factor analysis when you need it?